I have to admit that I’m pretty gutted we’ve reached the end of the football season. Sure, we still have a few good cup games and the Euro’s to look forward to but by and large, it’s the end of a truly memorable season. One plus side of the season ending, though, is that there are massive discounts to be had on this season’s football shirts and kits! Anyway, I was on Facebook tonight and a little Kitbag advert popped up in the corner of my eye. 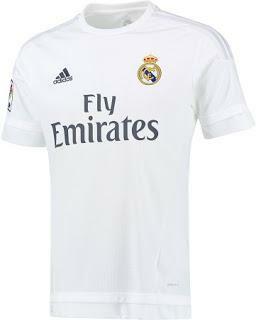 I could see that the Real Madrid shirt that I had been longing for had been discounted even further to £14.99! This brings the total cost including delivery down to just under £20, I can safely say that I’m in! And while we’re at it, I’m going to throw in a pair of matching shorts and socks which have also been discounted, bringing the cost of a full kit including delivery down to under £30, you’ve got to be happy with that! Or, if you’re in the mood to pick up some cheap official football shirts for your kids too, then you could qualify for Kitbag’s free delivery when you spend over £60 deal, meaning you save even more. So what’s the point of this post? Simply to inform you that if you are a football fan, then there are bargains to be had right now! There are many discounted adult and kids football kits up for grabs at this time of year and I wouldn’t want you to miss out, especially if you’ve had your eye on a particular kit all season long but just couldn’t bring yourself to pay full price for it. I found mine at Kitbag.com* but I’m sure that there are bargains to be had with other online retailers too. I hope that you find one! Have you taken advantage of the reduced football shirts on offer? 10 Timeless Good Cheap Presents For Kids! Do you take advantage of Groupon deals? Is It Worth Buying A Cheap Pram?